Patrick and I hosted family in town the Thursday before the wedding weekend and a mere two days before "I Do". The meal was fairly basic; no crazy entrees or experimental casserole dishes. I wanted to welcome the out of town folks with a spread of southern comfort food! 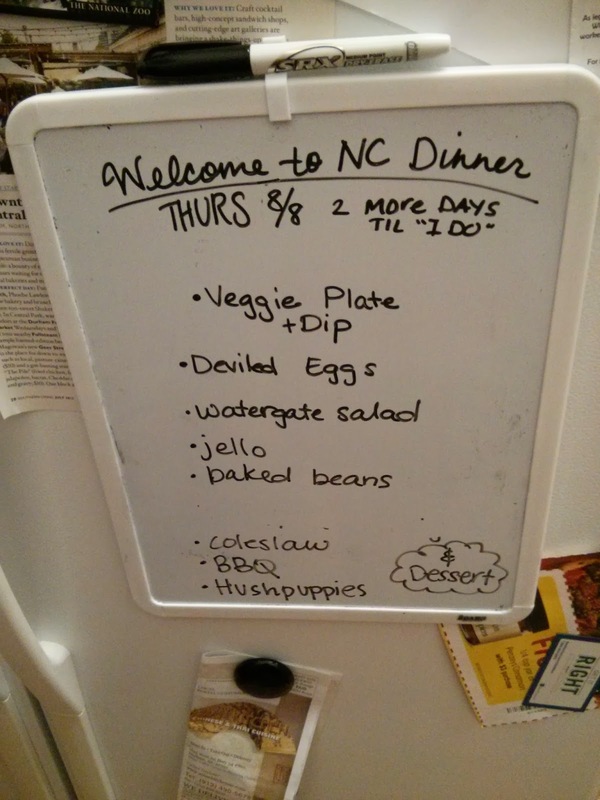 The spread included veggies and dip, deviled eggs, watergate salad, jello, baked beans, and all the fixings for bbq. Unfortunately there aren't any recipes to share. The reason I'm sharing this is because we used the meal as inspiration for our thank you speech after the rehearsal dinner. Read below for the speech. Thank you all so much; Patrick and I truly feel your love for us. We are so fortunate to be able to have you here. Patrick and I have a small thank you gift for our wedding party and family in appreciation of your time and efforts put forth to make this weekend a success. But before we hand those out, I’d like to tell you about how we cook with love. Most weeks you can find us with a meal plan, cooking some favorite recipes, some quick dinners, or experimenting with some new ones. We’ve dabbled with a food blog -- our apologies for the lack of content during the engagement -- we’ll start again soon I promise. But this cooking with love I want to tell you about is not about us, it’s about you. My cooking with love is cooking with you. Let me show you, last night we decided to take on the task of preparing a meal for family who had come in early. First, we had a veggie plate with dip.The dip was very simple: greek yogurt, sour cream, cream cheese, lemon zest, and lemon juice.Granny, I grated the lemon with the microplane zester you gave me a few years ago. Holly, I squeezed the lemon with the citrus juicer you gave me when we were Carrboro roommates. This is such a good juicer, I actually gave one exactly like it to Rachel for Christmas last year. We had bbq, coleslaw, and hush puppies catered but we made a few sides. Mom, I follow the recipe you made when I was growing up and still continue to make. I also served the salad in one of the Messer pottery bowls you gave me. The vegetables and dip were also served on a Messer pottery platter. Glenda and Bill, I made the watergate salad in one of the mixing bowls you gave me back in college. It was a set of three melamine mixing bowls and we use this quite often. Dad, I made the Jello in a corningware dish that was Nana’s. I also made the Jello the way I remember her making it. Instead of boiling water in a pot, she would always do it in the microwave which is much easier. Kathleen and Alex, I do not have a good hand-me-down recipe for deviled eggs so I consulted our “Cook’s Country Cookbook” and followed their recipe. You gave this to Patrick the Christmas after he had moved into his bachelor pad apartment. Revelle Family, after I had selected a recipe and hard boiled my eggs I poured them into the strainer you gave me when I was back in college. The strainer was part of a pasta gift set. There was the strainer, a pasta serving fork, and pasta cookbook. We currently still use all of these items and the pasta cookbook is one of our favorites. We enjoyed it so much we actually purchased other cookbooks in that same series. Mom and Jimmy, we made the the baked beans in the crockpot you gave me for Christmas a few years ago. And finally we had dessert. Mom and Jimmy, we made the brownies in the “all crust” brownie pan you gave us. I don’t think Patrick has made brownies without it since you gave it to us. And for that I thank Granny, who gave me my drive in the kitchen and a love for hosting. I had a lot of fun getting everything ready yesterday and enjoyed the fellowship of having our families meet and dine together. It’s such a joy to cook in my kitchen because I never cook alone; I cook with all of you and for this I am most thankful. Obviously we didn’t use everything in our kitchen to make this one meal, so please know that we use all the gadgets, cookware, and prep tools that you’ve given us throughout the years. As you can see we have most everything we need to make a good meal so we didn’t need to register for many upgrades. We chose a new everyday stainless flatware set, everyday dishes (an upgrade from Target), stemware, a formal china pattern, and a crystal pattern. Yall have been so generous with your gifts and know that as Patrick and I entertain in the future, you will be with us in spirit if you aren’t there physically. So thank you! We wanted to get these gifts to show our appreciation for all the wonderful things you have done for us during our engagement and the past four years. For Whitney’s fun bachelorette party in DC and the best bachelor party I ever could have asked for in Savannah; for traveling to Murfreesboro and making our parties there a success; for the generous showers thrown for me and Whitney; for getting the wedding party attire we picked out; for the crafting help on our DIY wedding projects; and for your love and support of both us through our entire relationship and never making Whitney and I doubt what we’ve found in each other. This is such a special night to look back on. What was really special is right before we gave this speech our family and wedding party members had the opportunity to share their well wishes with us. This intimate time felt like a celebration of our relationship and was a wonderful way to conclude the evening before our marriage began. oh wow, I remember it like it was yesterday! such a fun night.